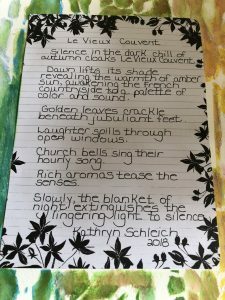 Having recently returned from 11 spectacular days writing and painting in the southwestern countryside of France, I had the opportunity to push myself in both areas. I have little to no talent in the realm of painting and was quite honestly hesitant to attempt it. But every participant was to present something on our final night in a gallery show to be attended by the local mayor and townsfolk. Early one morning well before the sun cracked the rolling horizon, I found myself writing a short piece on our experience. I’m not sure if it’s a poem, another first for me, but the words flowed naturally. With the guidance of Sue, our art instructor, I used paint and stencils to create the work which became a gift for our wonderful hosts, Bill and Corinne. The words and a photo of the completed work follows. Although not technically a retreat, I came back inspired and refreshed, ready to pursue my writing with a new passion and try things I might at first fear. Silence in the dark chill of autumn cloaks Le Vieux Couvent. Dawn lifts its shade, revealing the warmth of amber sun, awakening the French countryside to a palette of color and sound. Golden leaves crackle beneath jubliant feet. Laughter spills through open windows. Church bells sing their hourly song. Rich aromas tease the senses. Slowly, the blanket of night extinguishes the lingering light to silence.